Happy new year to all my blog readers! Now that it is 2016, I would like to reflect on what 2015 brought me, and my thoughts about the year ahead. First and foremost I feel part of a textile community, and 2015 really reinforced this belonging. 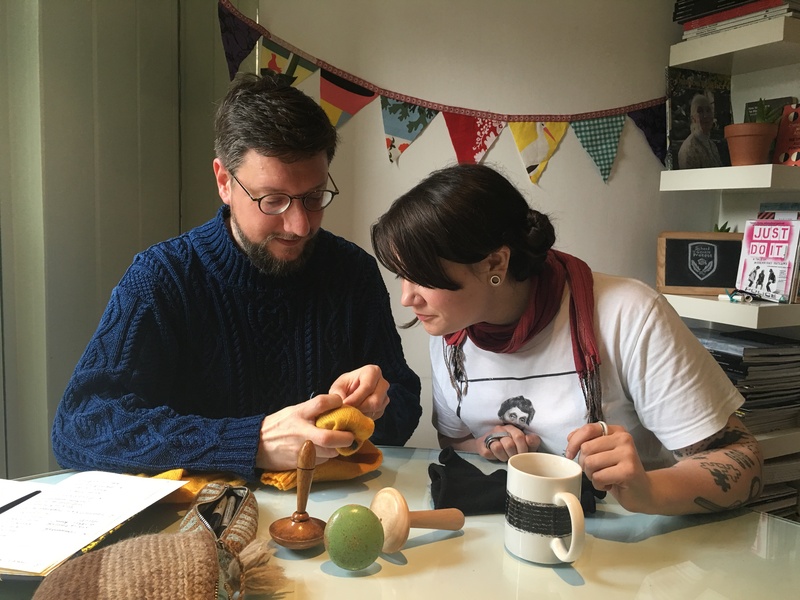 Attending events and venues such as Edinburgh Yarn Festival, Shetland Wool Week, Pitt Rivers Museum, and In the Loop 4, where I managed to meet up with friends old and new played a big part in this. 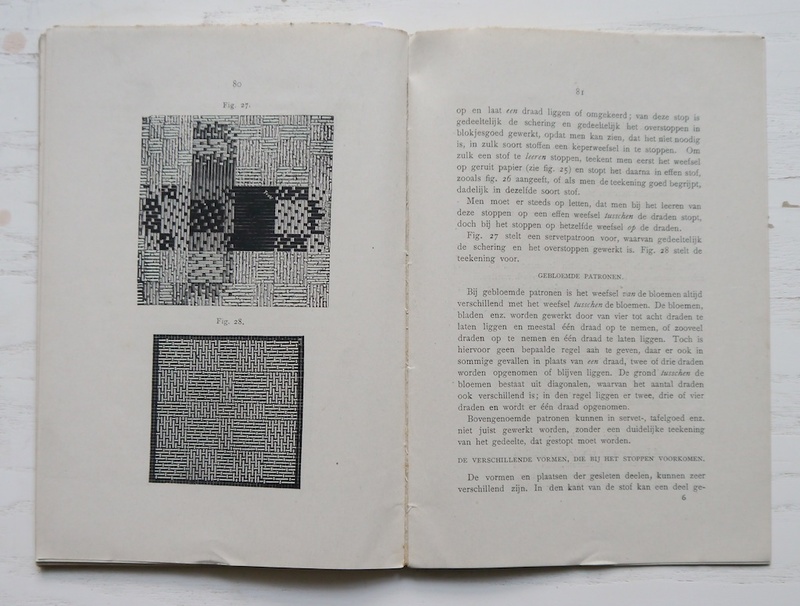 They all provided fertile ground for discussions about knitting, fibre, and wool. But it wasn’t all serious, it was a good way to catch up with old friends, and meet others for the first time, even if I knew their work well, or knew them through social media. It always feels good to meet like-minded people, discuss shared interests, and continue the conversations afterwards. It was nice to see friends taking on new projects and run away with them, and being able to help them out. In 2015 I learnt a lot of new things and many of these revolve around technique. Some bigger than others, ranging from a new-to-me superstretchy cast-on (double needle cast on, see June Hemmons Hiatt’s Principles of Knitting) to a whole new way of creating complicated textured fabrics using simple techniques, called Sequence Knitting. 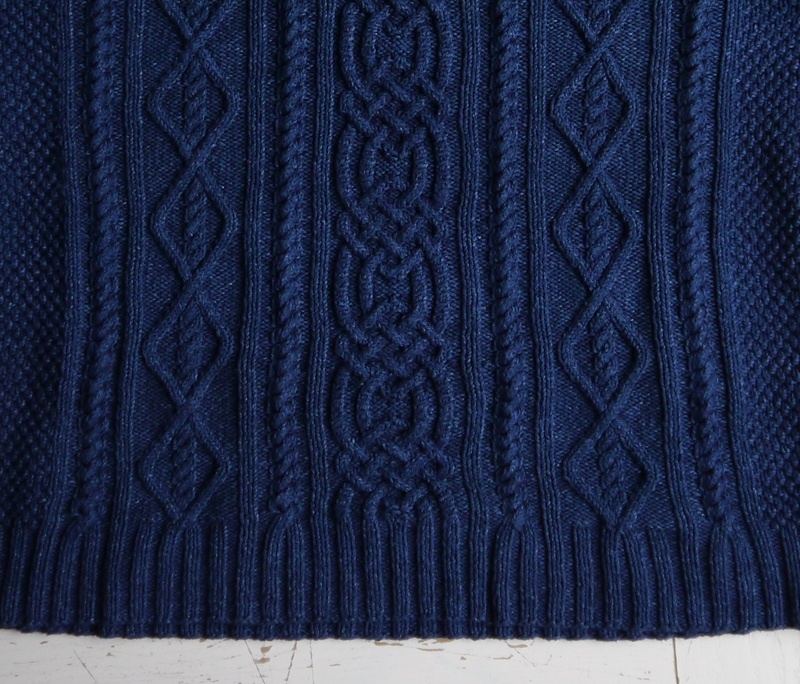 My interest in 1980s knitwear has blossomed last year: once you can see past the boxy shapes, a heady mix of technique, colour, and texture is revealed, and nothing was deemed too complicated. 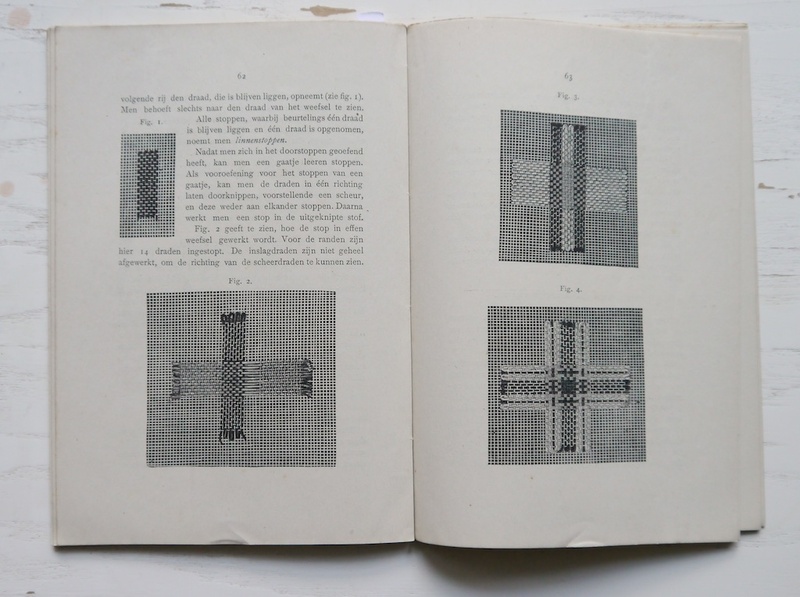 A collaboration with Wolf & Gypsy Vintage allowed me to explore the repair of woven textiles. Last year I’ve been thinking a lot about taking time in my creative practice. In a shift of focus from trying to keep things looking new and perfect to favouring the old and imperfect, means I’ve stopped looking at repair as a chore, but as a creative challenge in its own right. Instead of fixing something that is broken, which implies the item was finished, I now continue working on something that wasn’t complete yet. ‘Slowtober‘ has given me a lot of thought about the materials I use, whether these are secondhand or new, and as I explained in the linked post, there is lots of food for thought. 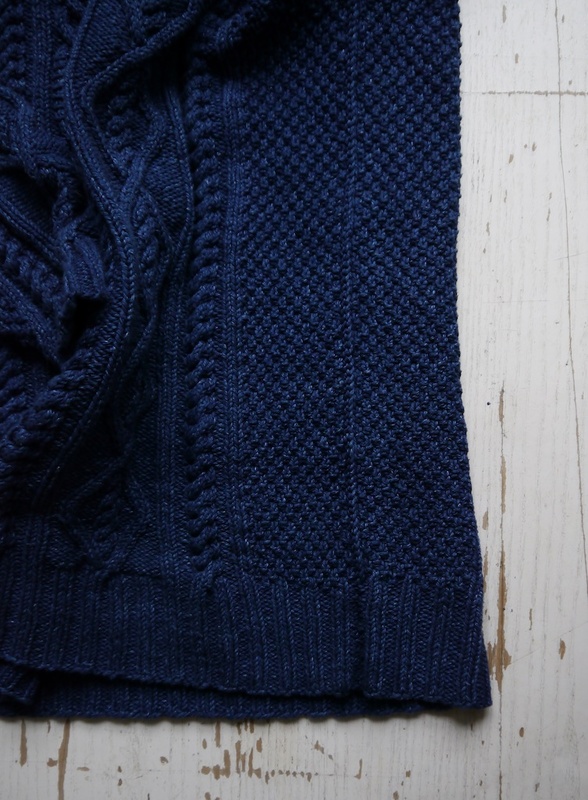 One material that made me really happy, though, is Louise Spong’s South Down Yarns. The sheep that provide the wool roam the South Downs near where I live, and if you read my interview with her and Jenny Dean over on the Wovember blog, you will learn about the provenance of the yarn, and the sensitive way how it is dyed. And this leads me neatly to the year ahead. I would like to spend more time spinning; I have plenty of fleece to keep me busy, and I’d love to spin a sweater’s worth of yarn. 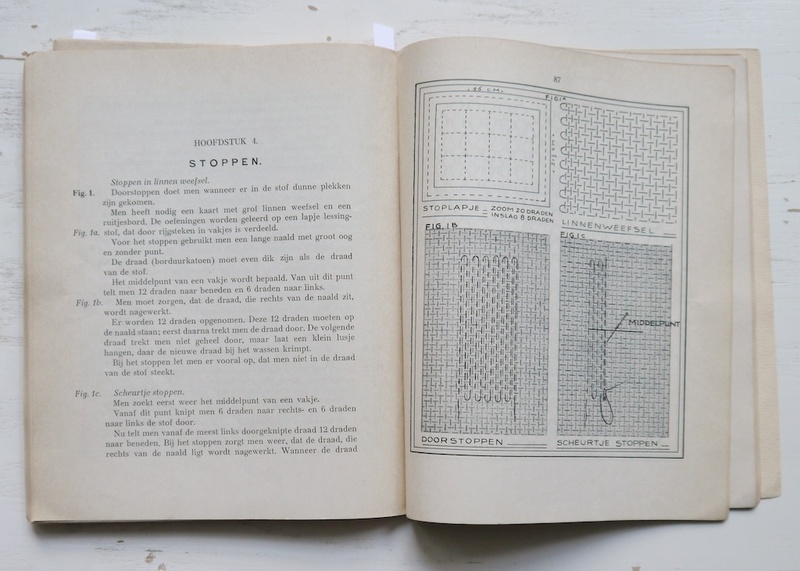 The Wolf & Gypsy Vintage collaboration, my interest in antique darning samplers, and my old books on clothes repair mean I would like to spend more time teaching myself more sewing skills, and I’d love to make a modern version of a ‘plain sewing’ sampler. 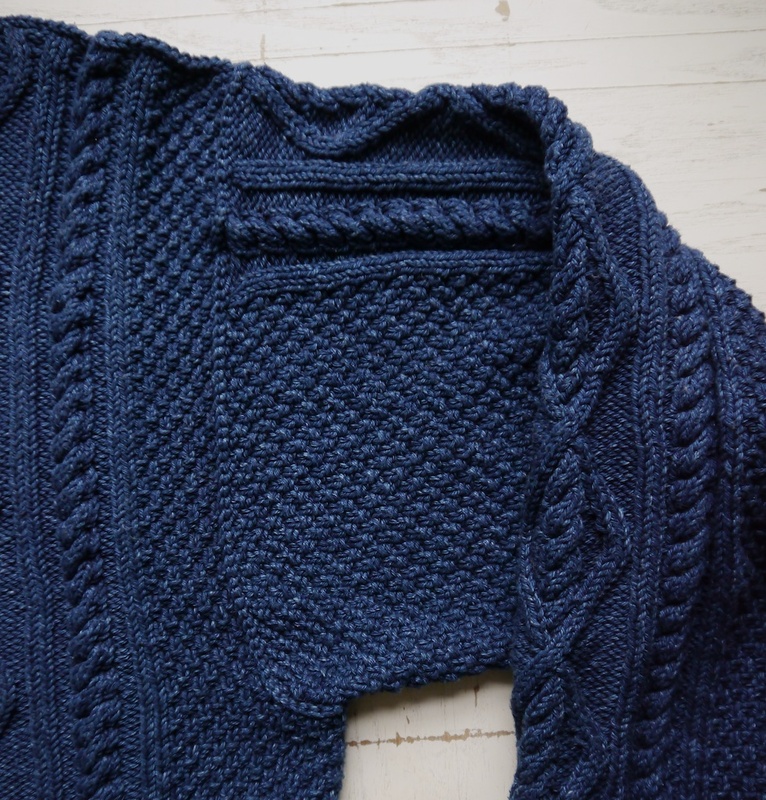 I also have more ideas for creative knitting, and like the Heraldic Sweater pictured above, they combine technique with elements left to chance. As always, I look forward to sharing my pursuits here on my blog, and I hope you will enjoy strolling along in the most leisurely fashion. Happy new year! In the last twelve months or so I have started to gain an appreciation for Taking Time. 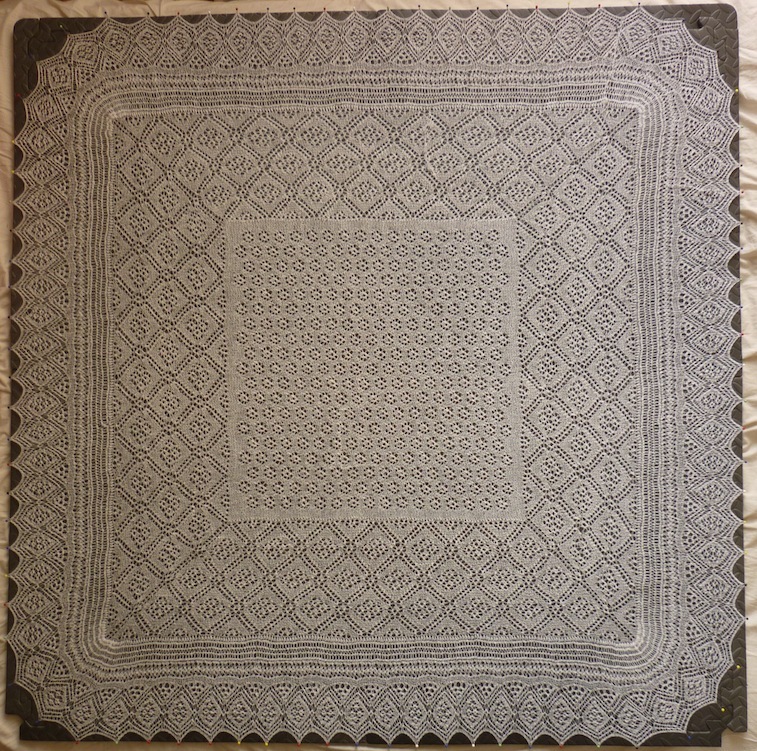 Although (hand-) knitting probably isn’t the fastest craft known to man as it is, I have never shied away from projects that take a particularly long time to complete, such as this holy communion shawl. However, I’m now more consciously slowing down. As I become more interested in using specific traditional techniques for specific tasks, I also feel an urge to take my time to to do the best job possible. I think my interest in this started when I took up spinning. 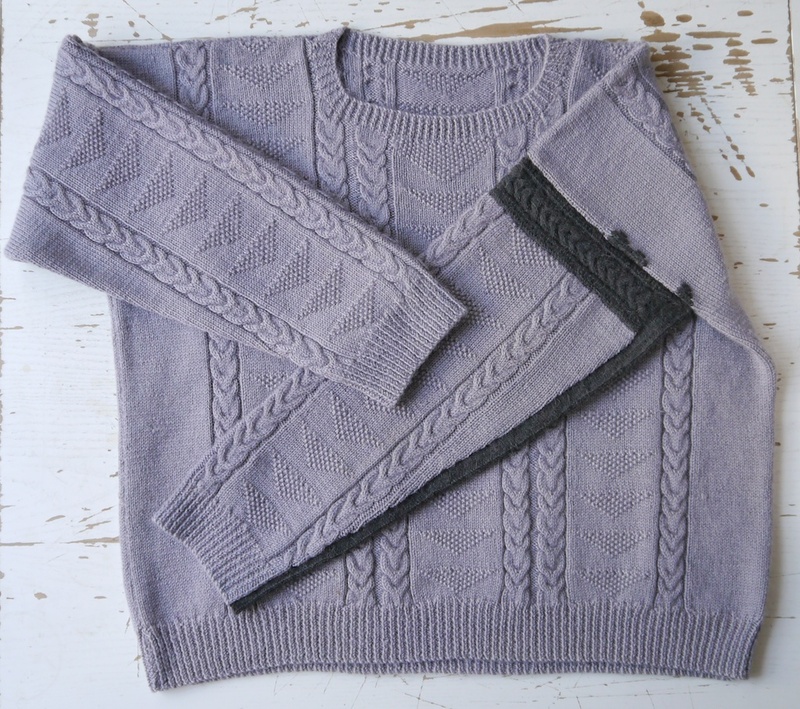 Working with wool is a tactile experience I enjoy, and now I’m seeking out opportunities to enhance this experience. 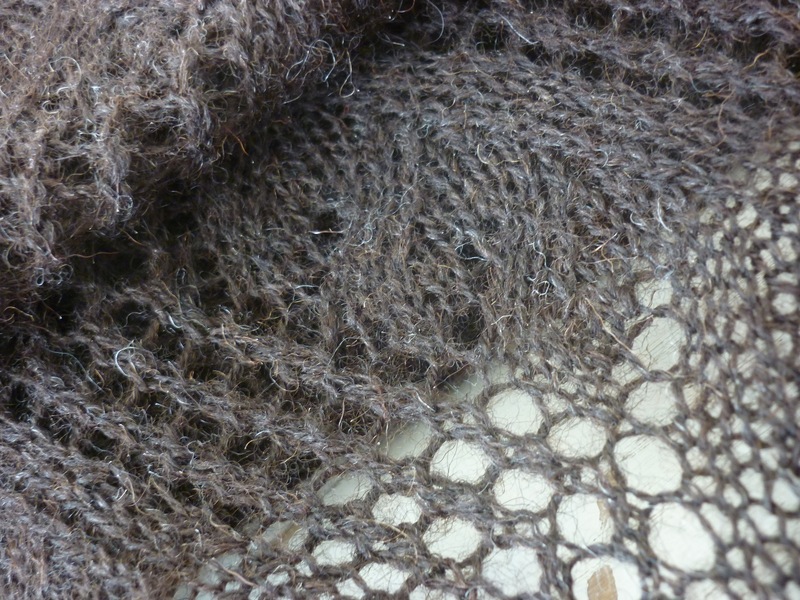 Taking time to handle the fibre at the various stages allow me to explore its material qualities. 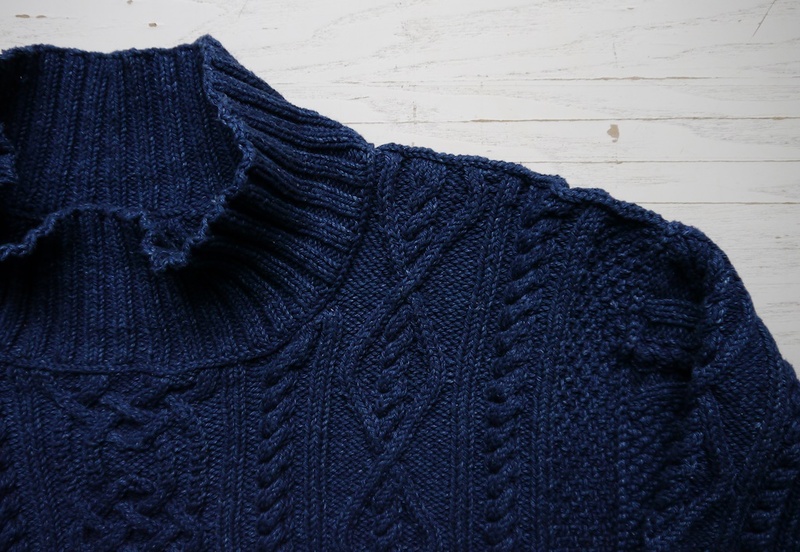 Of course, knitting in itself allows me that tactile experience by its very nature. But instead of using a skein holder and ball winder, I now prefer to use my knees to hold the skein, and wind a ball by hand. The rhythm of winding, going from left knee to right and back again, feeling the yarn glide through one hand, feeling the ball of yarn grow in the other, I can get to know the yarn I’ll be knitting up later. How smooth is the yarn, how bouncy is the ball? I dream about the project that it will become, contemplate how I can enhance the fibre’s inherent qualities. 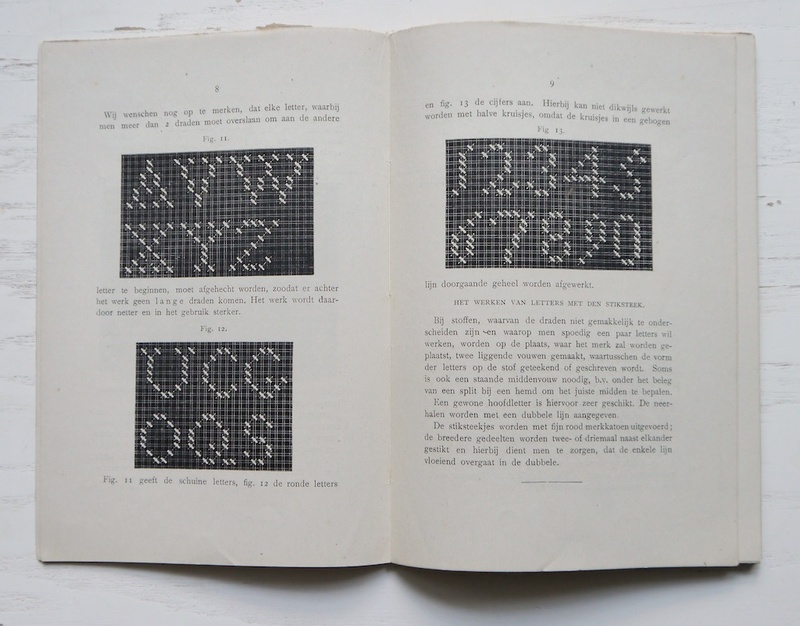 But as a spinner I can create even more opportunities to explore these tactile qualities. I love getting a raw fleece and process it from scratch. 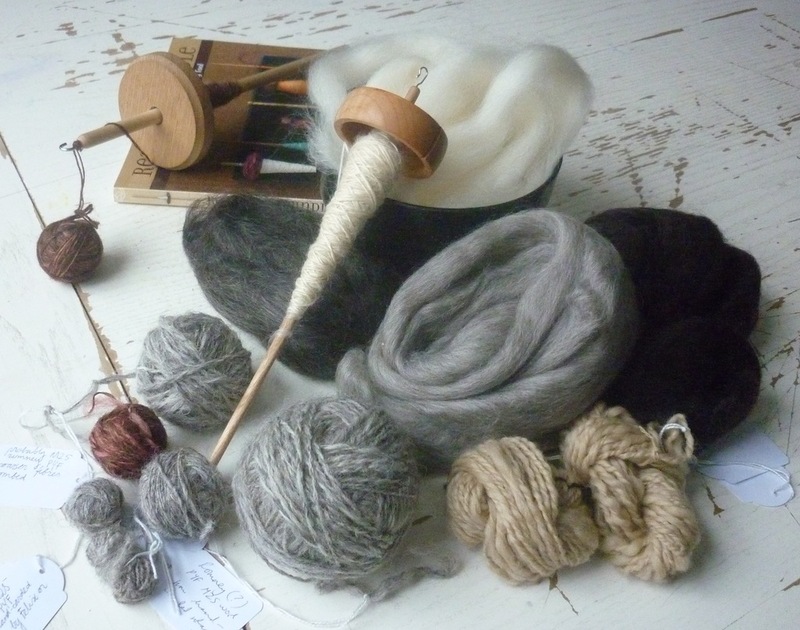 Laying out the fleece, sorting it, scouring it, preparing it for spinning; this all requires a lot of handling. Raw fleece feels greasy and at places, dirty, and smells strongly of sheep. It takes me right back to my childhood, visiting my grandparents’ sheep farm. During the scouring and drying the fibre transforms through its contact with water and soap. This process can’t be rushed, and it creates space to think about what this fleece might want to become. 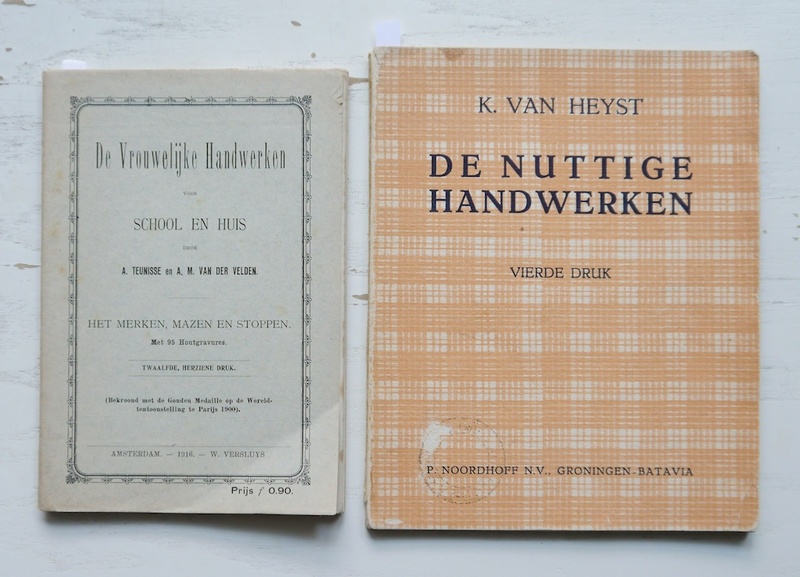 When I’m darning, I think not only about when this was a necessity, but also about the amazing darning samplers I have seen at the Fries Museum, Leeuwarden, The Netherlands. 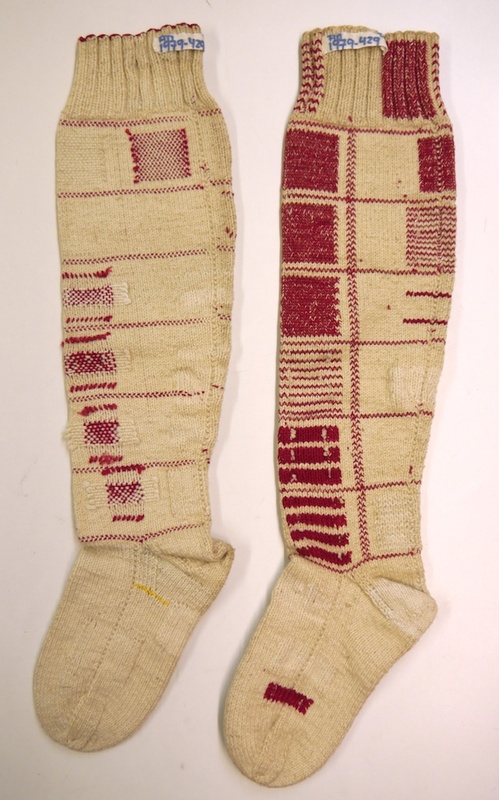 Young girls were taught to knit and darn and had to take time to create perfectly executed darning samplers. I also noticed during my visit to the Fries Museum, that the clothes in their collection were rarely repaired to the same high standard. I can only assume that the women couldn’t afford to spend a lot of time on this task, undoubtedly one of many when running a household, big or small. 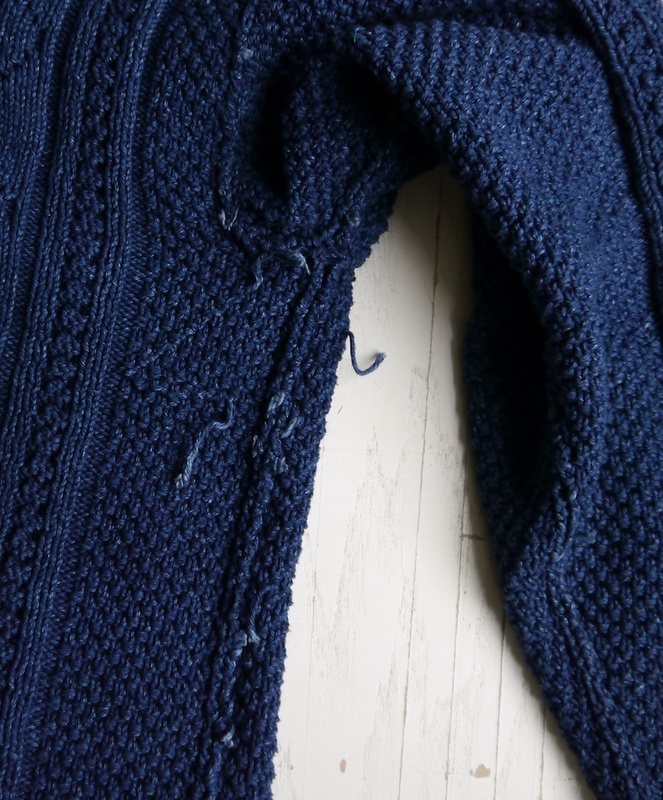 Things become more personal when I take on a specific darning commission, the most poignant example perhaps being the repair of Bernadette’s jumper. 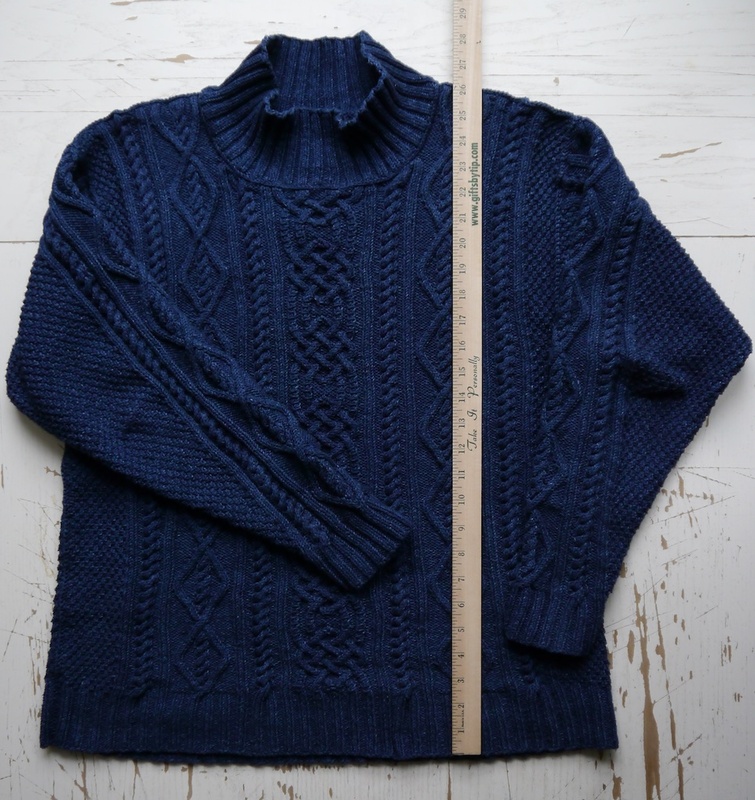 Just a normal jumper to most people, even if they recognise the good knitting skills that went into it, this jumper is very valuable indeed to Bernadette. 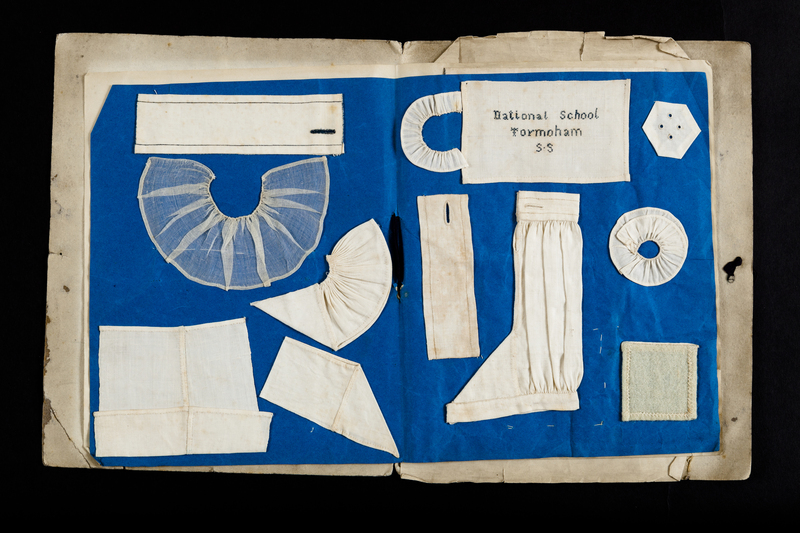 One of the few items made by her mother that she still owed, and a botched attempt to turn it into cushion cover made this a very special mend. 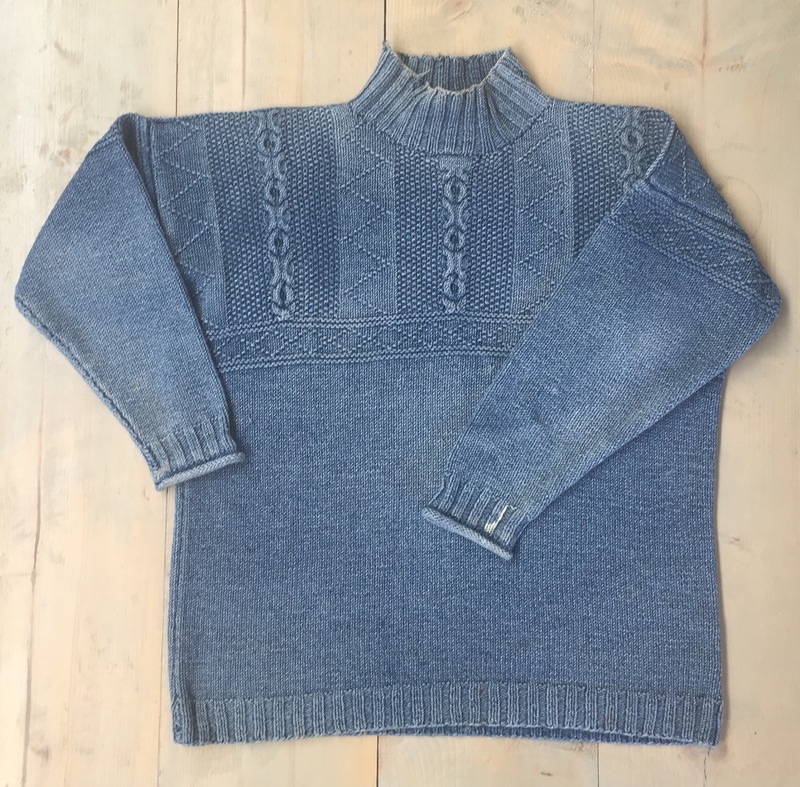 As Bernadette had given me the background story of this jumper, her relationship with her mother, and why she attempted to turn it into a cushion cover, the repair felt very intimate. 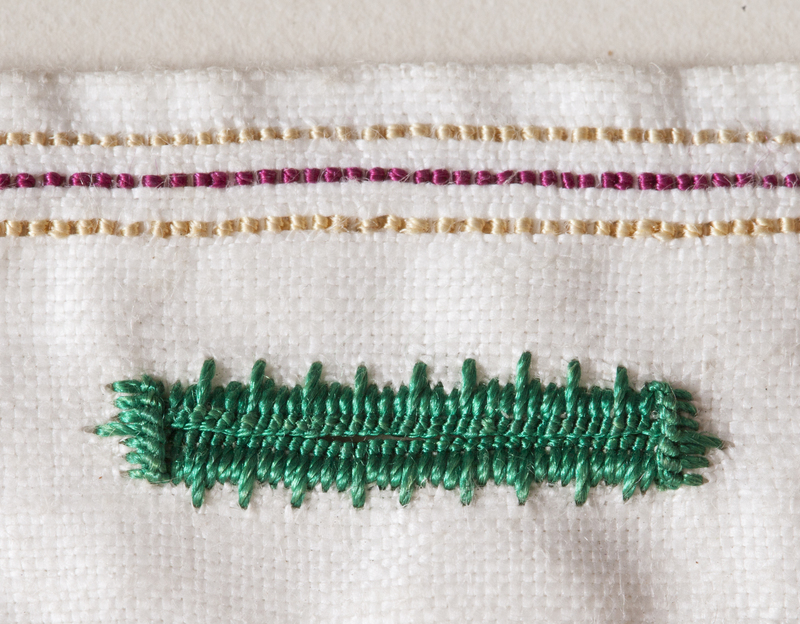 While preparing the pieces of the jumper for repair I let my mind wander and it allowed me to refine my repair approach. 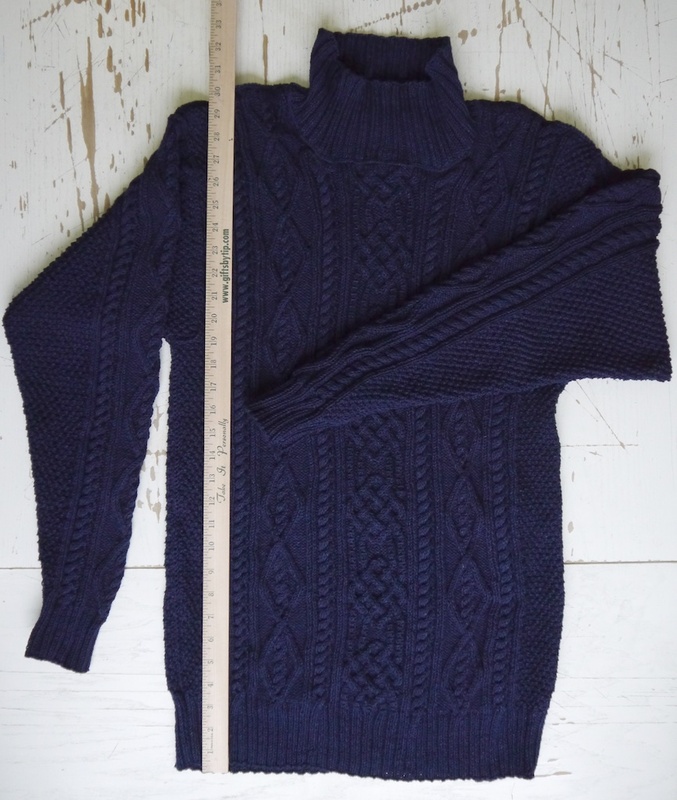 I wanted to show that this was not repaired by the person who originally made this jumper, and I used a variation of the cable stitch pattern to highlight this. Although I had never met her mother, taking my time to perform a beautiful repair, allowed me to contemplate this woman while I picked up stitches she had knitted many years ago; a very intimate act. In summary, giving yourself permission to take time has, I believe, many benefits. 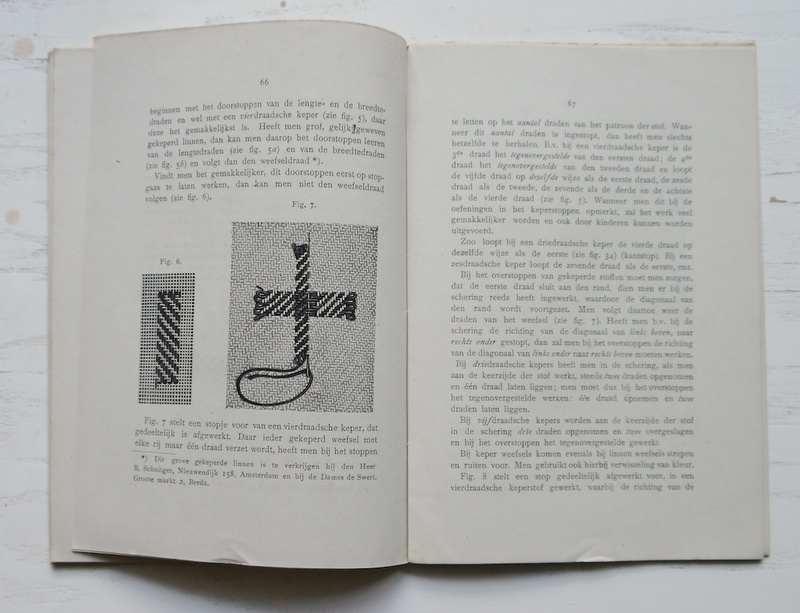 There is time for contemplation, exploring material qualities, and re-inforcing the connections between all the things I do. It makes my work a creative, deep and rich experience that I wouldn’t want to miss for all in the world.